To music lovers, there's nothing like a good competition, where we get to hear the stars of tomorrow. 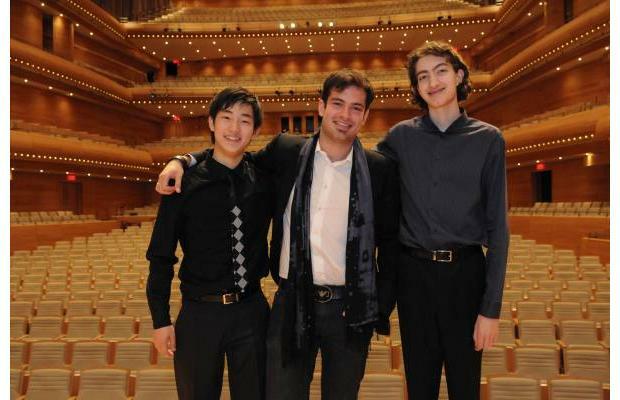 The Montreal International Musical Competition is certainly one of the best. I have been covering the MIMC since 2005 and I've heard repeatedly from many people (audience members, competitors, jury members) that MIMC is one of the best organized and prestigious classical music competitions in the world. Many of the laureates, be it violinist, pianist or singer, have gone on to significant careers. So this is an eagerly anticipated event for me every year. I received a formal invitation to cover the 68th Jeunesses Musicales International Annual General Assembly for La Scena Musicale, in conjunction with the MIMC finals, but a freak accident - resulting in an injured shoulder - prevented me from attending. Best laid plans of mice and men as they say.... Sadly, life intervened! However, all was not lost! I limped my way from Toronto to Montreal to attend the Winners Concert in the evening of May 17th, in the acoustically wonderful, Jack Diamond-designed Maison symphonique. And it was a grand concert indeed, a nearly full house. All six finalists performed, beginning with 19 year old Taiwanese Chi Li playing the last movement of the Mendelssohn Violin Concerto. This is a happy, bubbly piece of music, and Mr. Li certainly expressed that fully, with a fluent and liquid style that was a pleasing start to the evening. However, one wished for ideally a bit more weighty tone, more depth of expression through a great variety of tone colours. He was followed by the only female finalist, 18 year old Ji Young Lim of South Korea. Her "Introduction and Rondo Capriccioso was altogether lovely, beautifully expressive and with plenty of chiaroscuro. Twenty year old French violinist Fedor Roudine reprised his Tchaikovsky last movement with refulgent tone, although I find his playing lacking a bit in excitement. After an intermission, it was the first of the three laureates - 16 year old Chinese violinist Zeyu Victor Li played Ravel's Tzigane, a piece with a very long, unaccompanied solo right at the beginning. This piece taxes even the most seasoned violinist, someone with lots of experience. Mr. Li played it with astonishing ease, prodigious technique, supreme confidence, and uncommon poise - I ran out of accolades in describing his playing. The truth is that all these young artists have technique to burn - that's a given. But the best ones also have something to say. Victor Li definitely has a great deal to say, and I predict a great future for him. Second prize winner Stephen Waarts followed with the first movement of the Brahms he played previously. This enormously talent young man (another 16 year old!) played with the most gorgeous tone and uncommon musicality. I did notice that his stage presence was a bit too self-effacing, and he was distinctly nervous, wiping his palm on his pants at least a half dozen times during the performance. With some fine-tuning (no pun intended), Mr. Waarts will go far. The last performance belonged to 22 year old Belgian Marc Bouchkov playing the complete Sibelius Concerto. For the finals, he played the Tchaikovsky, so to have both ready to go was really impressive to begin with. Mr. Bouchkov's interpretation of the Sibelius was nothing short of stupendous - exemplary musicality, singing tone, abundant expression, bravura technique, and a musical understanding that belies his tender years. I was just overwhelmed by his playing, and I feel strongly that Mr. Bouchov was fully deserving of the First Prize. I look forward to hearing him many more times in the future. The conducting of Maxim Vengerov was terrific, very sympathetic to the soloists, yet allowing the marvelous Montreal Symphony to shine through. This competition underscores the depth of talent among the young artists coming up, and music lovers can look forward to the continued renewal of the art form. Thanks to initiatives of Jeunesses Musicales of Canada that spearheaded the MIMC in 2002, Canadian music lovers have the opportunity to hear the best young artists in the world, and I say 'Bravo'! $30,000 plus Sartory bow valued at $3700 Canadian. MIMC Grants for the Unranked Finalists: Chi Li, 19 Taiwan; Ji Young Lim, 18 South Korea; Fedor Roudine, 20 France. Your description is far from accurate. Same as in the finals, and even more so, Bouchkov's performance was sloppy, square, and predictable, while, Waarts' performance was full of surprises, in an amazing way and to amazing extents was both lyrical and brilliant, carried with one incredible breath from start to end, and in short: just unbelievable. I know the other orchestra members would agree that the true winner of all nights was Waarts, sweaty palms and all.